The Regina Astronomical Society started in 1910 when Halley’s Comet inspired some of Regina’s most inquiring minds. The generous donation of a Brashear telescope – unsurpassed at the time and even decades later – gave the club an excellent start. For the rest of the century, astronomy in Regina waxed and waned. The war years and Depression took their toll on club membership but the club survived. With its revival after the war, dedicated local astronomers built, moved and rebuilt observatories, chased meteorites, chilled themselves to the bone to view eclipses, and contended with everything from UFOs to opportunistic stray cats, all while sharing their delight in the universe with members of the public in Regina and surrounding areas. By the time Halley’s Comet returned in 1986, the club was going strong. In 2001, international history was made when a Regina astronomy club member discovered a brand new comet, now named after him. Like Halley’s Comet, it sparked new interest in astronomy, adding another chapter to the ongoing story of the Royal Astronomical Society of Canada - Regina Centre. This 712-page volume is packed with photos, news clippings, scrapbook notes, newsletters, meeting minutes and other materials that reveal how much effort amateur astronomers of all ages put into keeping the centre and observatories going over the years. Moreover, these bits of history show how well-respected the Regina Centre was in the world of astronomical science, participating fully in international events such as the International Geophysical Year (1956-57) and scoring some significant achievements in meteor counts for the National Research Council of Canada. It was the only amateur observatory listed with professional observatories in the 1950s and 1960s. Many people will remember the iconic observatory on Broad Street where the society met for many years before moving to the Saskatchewan Science Centre. 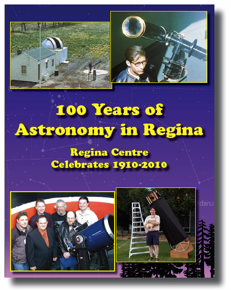 100 Years of Astronomy in Regina includes comprehensive stories of the Regina Centre’s involvement with the creation of the Cypress Hills Dark Sky Preserve, the largest one at the time, and the discovery of Comet Petriew. If you would like to place an order, please click the link below for an order form. 60.4% of the Moon is Illuminated.